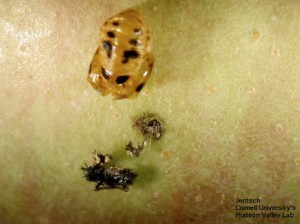 The green apple aphid complex (GAA) often develop in high numbers during the fall. This can occur after heavy rains promote new tree growth and succulent foliage for aphid to feed, providing ample nitrogen for rapid reproduction. We have seen GAA populations explode during seasons such as this to the point where the aphid will move from foliage to begin feeding on the fruit. Fruit injury from aphid feeding, although not expressed immediately, will appear during storage and cause the fruit to become unmarketable. 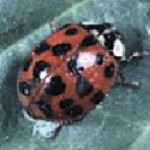 The multi-coloured Asian lady beetle, Harmonia axyridis (Pallas) (MALB), is an invasive insect that has flourished in the Northeastern US. Its overwintering presence in homes can not be overstated. 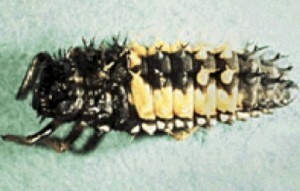 Introduced as a beneficial insect to manage the aphid complex, the beetle will follow suit and begin feeding heavily on the aphids during the Fall. This in turn may promote reproduction by the ladybug, producing scores of yellow egg clusters and larva that will mature to adulthood. As this occurs, a number of the larva will insert their mouth parts into apple, gluing themselves onto the skin of the fruit, leaving a shallow hole or blemish in the surface of the apple. In some years this event can cause significant late season fruit loss. If these two events occur this season, they can be moderated using LOW RATES of neonicotinoid insecticides as the aphid populations begin to develop. The goal is to maintain low levels of aphids and conserve the predators at equally low levels to reduce the impact of damage to fruit. For example, the use of Admire Pro 4.6SC at about 1/3 the high rate, such as 1 oz./A, providing a reduction of the aphid while having low impact on the beetle, will thus conserve the beneficial complex. by multi-coloured Asian lady beetle.